Last night, YouTube suggested a video for me. 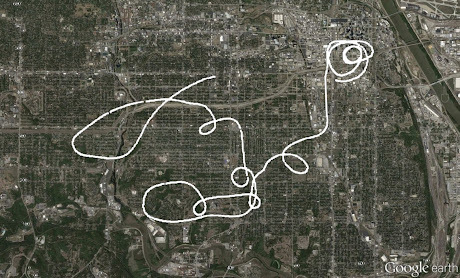 It was a raw clip from a news helicopter filming a police chase in Kansas City, Missouri. I quickly noticed a weird interference in the audio, especially the left channel, and thought it must be caused by the chopper's engine. I turned up the volume and realized it's not interference at all, but a mysterious digital signal! And off we went again. The signal sits alone on the left audio channel, so I can completely isolate it. Judging from the spectrogram, the modulation scheme seems to be BFSK, switching the carrier between 1200 and 2200 Hz. I demodulated it by filtering it with a lowpass and highpass sinc in SoX and comparing outputs. Now I had a bitstream at 1200 bps. What could it be? Location telemetry from the helicopter? Information about the camera direction? Video timestamps? When the received curve is overlaid with the car's location trace, we see that 100 steps on the curve scale corresponds to exactly 1 minute of arc on the map! Update: Apparently the video downlink to ground was transmitted using a transmitter similar to Nucomm Skymaster TX that is able to send live GPS coordinates. And this is how they seem to do it. These are the full lat/lon pairs of coordinates (39° 3.86′ N, 94° 34.20′ W). Nucomm says the system enables viewing the helicopter "on a moving map system". Also, it could enable the receiving antenna to be locked onto the helicopter's position, to allow uninterrupted video downlink. Thanks to all the readers for additional hints! Why do I get the feeling that you are going to be contacted by a shadowy organization for an off-the-record secret mission with an infamous jewel thief (sprung from prison just for this event) and the last Real Ninja, a side show contortionist, an experimental weapons expert, a bumbling but brilliant scientist and George Clooney? What tools did you use to decode and analyze the data? Perl and SoX. Also used Baudline as a simple waveform inspector. Perl. The programming language for super humans. This is fascinating. Would it be too much to ask for a detailed step-by-step of how you did this using the tools you used? How did that single get into the video in the first place ? Telemetry from heli was in the form of audio ? I love reading about people that do this stuff. Totally awesome. Great work! HACK THE PLANET!!! What software did you use for the "magical image analysis"? Plotting the car's position was actually all manual work. I've done that before from videos. Funny you should say that, Dr. Arroway was one of the reasons I ever got into decoding signals back then. it's not funny "Anonymous" said that; they know what you watched when younger. Dr. Arroway was my inspiration for getting into radio as well. Eventually I'll live somewhere I can actually put up an antenna of decent size. I just had to log in to comment. I remember watching Contact as a kid (I can admit I cried). Awesome touching movie but it never got me into HAM or signal analysis. Oona, you're an inspiration. Keep publishing stuff like this! I'm curious what tool you used to threshold and software decode the UART stream to get the hex log? Nice find - what I'm not clear on is how the digital signal ended up on the recording. Was this signal picked up via induction on one of the microphone inputs? I can't image there is a speaker squawking the digital signal out loud... this is the real mystery to me. The Skymaster TX deliberately inserts position data to enable infographics etc. If they did this in a movie, I'd be like 'yeah, suuure you can do that..'. I think you might enjoy ham radio. Wow, incredible hack! Thanks for sharing. Nice job. I second the comment about amateur radio, if you find analyzing signals interesting you'd probably enjoy some of the digital modes. If I came across this video I'd have piped that audio channel through a software decoder too! And you can do all sorts of things general public (just can't) like ping the space station as it passes over or have a voice chat with an astronaut. Or just talk to someone driving around. It's neat. I know, I am a fellow ham. Brief intro on my radio page. only through ADSB and DFing the beacon and maybe WIFI/Bluetooth and cells in their pockets. No I don't think they'd bother encrypting the telemetry, since the location data can be gotten from a subsidiary high bandwidth unencrypted back channel - by looking up! Yeah, because it's really cheap and useful to replace this kind of specialized equipment. So they need to develop a crypto device with multi-platform phone app - two days? Then the news stations have to switch to the new device and throw away the old ones - another two days? And all this just for hiding publicly available data (just look at the sky). Wow, I am impressed. Most notably, with noticing the interference stream in a YouTube video and bothering to investigate it in this detail. Massive respect. Why are you Fins all such geniuses? Bell 202 FTW. I always loved that protocol - silence when no data was sent if I recall correctly. AppleCat was my first 1200 baud modem - more than 10x the speed of my prior Bell 101 device! Always a walk down memory lane to catch 202 bursts on bleed-overs from leaky phone line with CallerID delivery. But kudos to your demod on the weak data. Next up: if you can get 30fps of flickering LEDs in the background of some random scene, can you decode what they're transmitting? Tricky timing questions! Did you come to any conclusions as to the use of bytes 11-13, and 20? After inverting, scaling, and offsetting packets 500-1800, they look like the other two groups of values. However before 500 and after 1800, they deviate somewhat. ..And Silver Medal goes to Chuck Norris. When Gods want to do something cool, they call her. Do you think Kansas City's involvement with Google Fiber has anything to do with this? Great post, and thanks for sharing. I will explain it to my kids so to see if they get hooked into this kind of things and develop the curiosity that is needed to become like you. My compliments. I wonder if the interference noises that i can hear in my car speakers when my cellphone talks to the celltowers can be decoded too. Did you ever think about it? I did, see this previous post. Reading your blog a page of a book came to my mind: Peter Høeg's Smilla's Sense of Snow. Smilla gets an old audio cassette tape and brings it to an old blind audio and language expert. He manages to decode the language and to identify the speaker age, education, and place of origin, basing on dialect, accent and tone. A nice page about language reverse engineering. L #NA 272 0003.0 is this 272ft of elevation ? Yes, by the looks of the curve it makes, it's probably elevation. Saw this via Twitter - Brilliant! As a deaf person, I'll never think you could find digital signals in the audio channel. Goes to show that all grounds must be covered including those that seem silly! Having listened to lots of them, I've begun to have an ear for certain modulations. This is really cool. Nice work. Could you post the data file? Should be possible to add a live map view to the video. http://oona.windytan.com/coords.txt, but it doesn't contain timing so can't be plotted live. Some packets are missing from in between. Yeah, without timing and missing packets its going to be difficult. Would have been cool though, especially since you also created a track with the car's location. Each point's title is the seconds into the video (minus 0.185), and the description is the elevation value. Thanks for the kml file, Timothy. With that it should be possible. How did you manage to obtain the timing info? You're welcome. When I decoded it in a Matlab script I wrote, I took care to preserve the timestamp of the beginning of each timestamp. Sorry, I meant "the timestamp of each data packet." Well done. A very good program to decode the AFSK directly is called minimodem http://www.whence.com/minimodem/. I am familiar with a version from a different manufacturer of this type of tracking system, NSI or N-systems. Originally gps rs232 data from the helicopter’s nav system was used, a Trimble protocol called RNAV r1, sent to a bell 202 v.23 modem running at 1200 baud. This audio signal was sent to one of the audio inputs of the microwave transmitter on board the ship, the same one transmitting the live video. The audio was pulled off at the receive site, decoded locally by the tracking system that drove the receive antenna to automatically follow the live coordinates from the moving helicopter. As gps has become more common the units no longer depend on flight computers, but due to backwards compatibility issues they still use the strange protocol. The earlier system was waypoint based, the copter transmitter antenna was pointed at a known waypoint (the receiver) this bearing-to-waypoint info was simply reversed 180 by the receive site to point at the helicopter, but this system doubled any pointing errors. 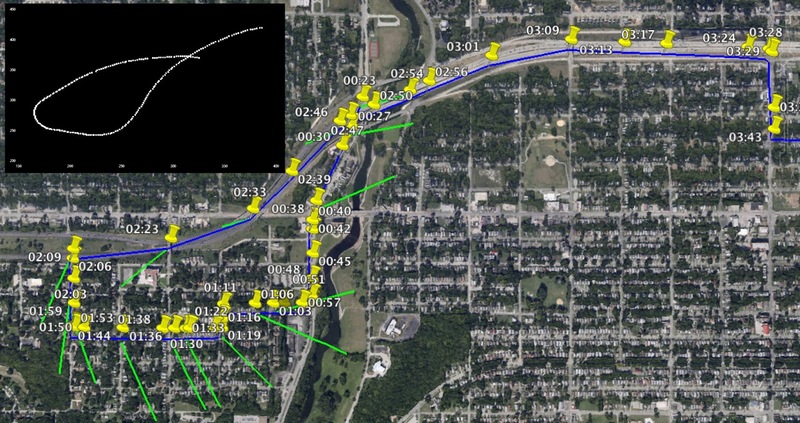 The newer systems simply track the lat/long coordinates. Much of the reason it is done with audio is for legacy compatibility. The original versions of these systems used analog microwave links, extremely susceptible to breakup and mulitpath with any antenna pointing errors. Bell 202 worked great with the limited bandwidth audio subcarrier used, and usually didn't creep into the second voice/nat sound subcarrier. Every ENG helicopter microwave system is now digital and much more resilient, but we still use AFSK tracking data because that's how the infrastructure is set up. Because you are a hacker you are maybe interested in knowing that this specific finding is not unique in these devices (even if the manufacturer says so) because this technique has been used already years and years in these video links. Have you tried using GNU Radio for signal analysis? It can take some time to learn, but it is a very powerful and useful tool for this sort of reverse engineering project. GNU Radio seems a bit too complicated for me. I want raw samples and Perl. I find GNU Radio to be a great way to get from raw samples to bits. If you get stuck on a complicated modulation scheme someday, you might want to give it a try. This is some amazing work, thank you very much for sharing. After having read a few of your posts and watched some videos, I'm wondering how you generate these nice plots like the one with the raw signal, the demodulated data and the black background. I'm also wondering what program you used to generate the real-time spectrogram in the video on the 15.6 kHz high-pitch noise of the CRT. I like to visualize my results for my audience, but my visualizations are far inferior to what you are showing. Would you mind sharing? It's often a mixture of Baudline, oscillo.pl, and Inskcape. See the first sentence of the post, there's a link. Look up APRS for more information on the Ham radio system that is very similar to this. Sending your location speed heading and other infomation in about a .7 second burst every x number or minutes. wow, this is so cool. I love when you post articles like this. it inspires the inner geek within me. Very impressive signal decoding. I'm fairly new to LInux, and to SoX, but I'm trying to recreate your decoding of the GPS location data from the YouTube video, as an exercise in learning. With respect to the decoding of the BFSK 1.2kHz and 2.2kHz signals representing the binary data, how did you compare the two sinc filtered signals to create your baseband digital bitstream? And also, how did you decide which frequency (of 1.2kHz and 2.2kHz) represented a binary 0 and which a binary 1? Take the filtered signals, run any kind of envelope detection, and then just use basic inequalities, "bit = (mark > space)". I found a similar case (this time a Police helicopter) and tried to replicate your excellent work. I could not easily demodulate in software, so I used minimodem. Congratulations for the very interesting blog! Hi Ms Oona- I had a similar mystery yesterday taking our local bus on public transit. Listening to my AM/FM headphones I noticed on AM radio, every time the door to the bus is opened and only the FRONT door, a signal that sounds like a fast siren interferes with AM radio. I thought that was interesting. I wonder if a signal is sent back to the head office to note each time a door is opened? You're probably hearing electrical interference caused by the door motor. AM radio is very sensitive to motor noise. I'll add my compliments to the pile. It's incredible work. Also, I imagine the posters you've kicked out will start popping up in classrooms. Few electronics teachers "get" aesthetics and infographics the way you do. Note, there's a "sample manual" with photos of the receive station user interface on page 3-26. Awesome post! I have read through it a few times now and each time I come away with something new to learn about. Thanks! Also, I found this video https://vimeo.com/111414803 of you explaining the process above. Didn't see it linked here so I posted it for the benefit of the other readers. I've heard this signal to, and it's always coming from a helicopter news reporting. However it's usually NOT on during the entire duration of the helicopter reporter doing their news report. It usually comes on just after the person in the helicopter says "now back to [insert anchor-man's name here] in the newsroom" and switches off their broadcast signal from the helicopter (maybe accidentally switching on their telemetry too soon). I've never heard it on any news broadcast for more than 1 second. It's very interesting to see that you have a much longer sample of it here. How did you get it? It seems that they have no reason to send the telemetry over the same channel as voice audio, as that messes up the sound of the person you are trying to listen to. Why not have a separate transmitter and antenna dedicated to telemetry? Also, it's NOT 7bit ascii (or at least not being sent "in the clear"). 7bit ascii standard is 2 start bits (or sometimes 1 start bit), 7 data bits (for ham radio, though other applications usually use 8 data bits), 0 parity bits, and 1 stop bit. A start bit is a binary 0, and a stop bit is a binary 1. Also the bit order is usually MSB first. I have a ham radio decoder software capable of decoding raw 7bit ascii FSK stream at any baud rate, and any frequency shift, and it can't decode this thing. I tried both polarities (upper tone = binary 1, and lower tone = binary 1). Neither polarity decoded it. It can also decode 4 modes of ascii (including non-standard variants). Ascii 8 bits per byte, Ascii 7 bits per byte, Ascii 8 with MSB clear (7 bits, with one 0 bit for padding to 8 bits), and Ascii 8 with even parity (8 data bits plus a parity bit for a total of 9 bits between the startbits and stopbits). I tried all for of these modes with both tone polarities. It only decodes random garbage. I tend to believe that this signal is in fact encrypted, and you managed to somehow crack the encryption to decode it. The telemetry is separated from the voice audio by simple stereo separation, and will not normally be broadcast on TV. You can decode 7-bit Bell202 using minimodem. You can read more about the Bell202 interface in this 1976 document. Can you make the perl script available?...on github? better yet can you provide us with your(perl) Hex tool which you highlighted the octets...Image #3 on this page? You da real MVP, bro! The comments section is pre-moderated; it will take some time for the comment to show up. You might want to check out the FAQ first. A programmer, geek, hacker of signals from Helsinki, Finland. Fond of DSP, sounds, mysteries, music, and vintage tech. Absorptions is my personal hobby blog. I write about my research and adventures in the world of signals, and fun things I do with the computer. windyoona@gmail.com ... Powered by Blogger.